After experiencing the Spuyten Duyvil, I had to visit their Grocery. Walking the 3 blocks over to the store from the bar, I was hoping that it would live up to the bar and have an extensive selection of beer. Fair warning, the store is not on the street, it is inside a mini mall and can be a bit hard to find if you don’t know where to look. 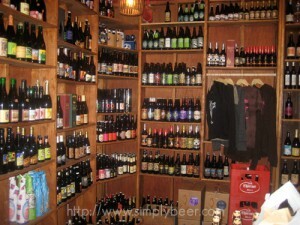 The Grocery is a tiny store, but it trapped me in with dark wood shelves and all the quality beer. I probably spent about 15 minutes looking and reading bottle labels. Most of the beer they had I could get locally and I didn’t want to have to lug beer around Brooklyn the rest of the night. But, I found a couple of beers I’d not see at my local stores and I had to buy them – Bourbon County Brand Stout, Mikkeller Geek Brunch Weasel, and Allagash Hugh Malone Ale. If you have a couple extra minutes there, spend a couple minutes chatting with the guy who works there, he knows their beer well.